Sometimes, the solution is worse than the problem. Politics aside, there are just too many examples to point to where someone should just have left well enough alone. * The desire to hide or keep something out of the public eye is so common that there’s even a name for it: The Streisand Effect. In 2003, Barbra Streisand sought to have photos of her Malibu, California, home removed from the Internet. An environmental activist, Kenneth Adelman, posted aerial photos of her home “on his website as part of an environmental survey.” Steisand sued him. Her actions had the exact opposite effect of what she was aiming for. The lawsuit “brought more than a million visitors” to his website. The case was dismissed and Adelman’s photo was widely distributed in the press, according to a May 2007 article by Andy Greenberg in Forbes.com. * Who hasn’t had a headache when moving? 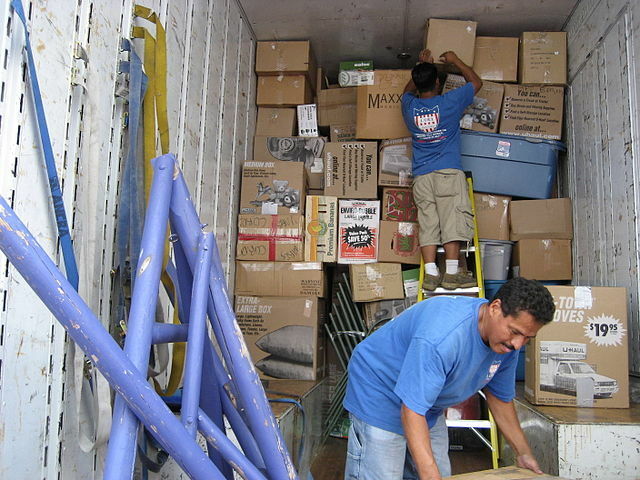 If only all moving firms were as careful as these men are. Broken furniture, missing items or belongings delivered weeks after promised. The latter happened when our eldest daughter moved to Florida to attend college. The van arrived weeks after she did. Until it did, all she had in her apartment were the few meager belongings she packed in her car. It’s probably a good thing for the company that the website Yelp did not exist then. Yelp, a multinational company, publishes customer reviews about businesses. One customer, upset with the terrible service provided to her parents, gave the moving company a low rating on Yelp. The moving company was not pleased and threatened to sue the woman if she did not take the review down. What they got instead was a deluge of negative publicity and tons of unwanted attention from the media. The moving company withdrew its threat. * What kids don’t complain about their school lunch? I recall a lunch revolt at my high school many years ago, when kids refused to buy their lunches until the school offered better selections. This story does involve political intervention and fallout. After public furor over the ban, Martha Payne was again allowed to take photos of her school lunches. Hopefully, the menu choices improved as well. * The last entry in the what were they thinking file is the “noble” experiment – the 18th Amendment which took effect in 1920 – that made it illegal to make, sell or consume alcohol. It was deemed a failure – Richter-scale huge – and repealed in 1933. In Ken Burns’ “Prohibition” – a three-part series on PBS – he showed that, much like drugs, alcohol was brought in by planes, boats and over the border by cars. It also was illegally made and sold in the United States. You can read my story on this here. Prohibition was intended to reduce crime, but it actually did the opposite. The “unintended consequences” of Prohibition was demand for the product increased, and crime – which became more organized – filled the void. Sometimes, it’s better to shrug it off and let it go. Just ask Barbra. Have you a story about unintended consequences that you’d like to share? Please share. Next article What Would You Do? I never shrug off your posts, Judy! Hi Anne. See you follow here too. Sometimes doing nothing is the best course. Stop while you are ahead, leave well enough alone – these are the cliches that pop into my mind reading your posts. Like Ann, I never shrug them off. A master storyteller you are, Judy. Both of those time-tested sayings are true, Marian. Thank you for your compliment. A current news story deals with unintended consequences–parents who do not have their children vaccinated. I’m sure they did not intend to spread measles (and other diseases) to others, but that is the unintended consequence. Unintended consequences can be good though. For example, suddenly deciding to add an ingredient to a dish, resulting in something that tastes even better than the original. 🙂 And there are also great scientific breakthroughs that developed from unintended consequences, such as the discovery of penicillin. On the measles, and other vaccines, there are children who cannot get those shots for medical reasons. So they are at greater risk if they’re around children who haven’t been inoculated. I know this is a controversial issue. I can only say I had many of those childhood illnesses – mumps, measles and chicken pox – and am glad my children had the shots so they didn’t come down with them. Your journalistic talents were in full gear today, Judy! This is superb! Just ask Barbra is right. I remember that fiasco and actually applauded the proof of cause and effect, even for the rich and famous. Now I know there’s actually a term, the Streisand Effect. And Martha is now 12 if my math is right. Can we recruit her from Scotland and turn her loose in Washington? Washington wouldn’t know what hit them if Martha Payne was cut loose in the capitol. I’d cheer her on. We also need a Jamie Oliver on campus. I see what our students eat. Actually, though, it would take a mind meld to change their eating habits. They love the salty and the sweet. Not so much the nutritious. yes, sometimes it is better to do nothing, but it also can be the hardest thing to do. Unintended consequences are a fact of life. They tend to be really negative when a motives for acting stem from the belief that s/he deserves special treatment. Unless someone ties me up and gags me, I have a hard doing nothing. 🙂 Great post, Judy! I’ve spent all day helping my parents move into their new home. So far, nothing is missing, but there are a lot of boxes yet to be unpacked. Hopefully, everything arrived intact. When our daughter’s stuff finally arrived, it’s a good thing she checked everything out because they almost gave her someone else’s bike by mistake. 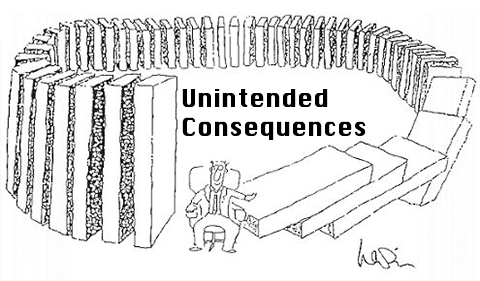 I’m wondering whether Brian Williams is ruminating over the subject of “unintended consequences” right now. I think a good example of the subject is medicine. Those unintended consequences called side effects. WWII falls into the category as well. Historians point to the Treaty of Versailles which punished Germany so at the end of WWI as setting the stage for the next great cataclysm. Fascinating story about Barbra. Barbara … I used to watch Brian Williams and liked him. Very disappointing. As a kid, I learned that credibility is everything. He needs to rebuild trust. Excellent point about Germany at the end of WWI. Splitting Berlin into East and West after WWII certainly didn’t seem to be a great idea either. Yes, I am very disappointed too as he was a favorite of mine. I keep thinking “What were you thinking, Brian?” I heard this morning he is taking himself off the broadcast for a while as he himself is too much of a news story now. We’ll see what happens but I don’t think there’s a happy ending here. Such a shame. I love this one today, Judy. Great examples, all, of too much and bad-timed jaw-flapping. I’d never heard the term “The Streisand Effect” until reading it here. Wow. Babs backfired with that one. Somehow I thought I was going to read something about a critic who panned her early work and had to eat his or her words for the rest of the career. 😦 Why would I think of that? Thanks, Mark. Beyoncé pulled something similar when she and Jay Z demanded that unflattering photos taken of her while she was performing be removed from the internet. Instead all the unflattering photos that she objected to were given a wider social media platform. One of them is on the link. With apologies for the intrusion, but I thought, since you were kind enough to leaves a Like/Comment on a relevant post, that you might like an opportunity to vote on the issues raised by recent WordPress changes. There is an overall objective and Voting starts here. Thank you, GrahamInHats, for your efforts to improve navigation on WP. I followed your suggestions and put “Dashboard” and “My Stats” on my Favorites list. That is a wonderful assist in avoiding the confusing maze that WP has in place. I also voted. Let’s hope the WP folks are listening and make changes that are more user friendly to those of us who blog. The wonderful Paul Mccartney said ‘Let It Be’ . My wonderful mother used to say ‘It’ll go ‘ . I’ m inclined to say ‘ Go for it girl ‘ Martha Payne deserves a mini knighthood …have you ever seen a meal like that one . I have to be honest I like to my a fuss because think of all those people way back in history that did they made a huge impact …Ok so some got it wrong nature of the game . I’m not sure if that photo is of a full lunch or of the snack offering, according to one of the lunch ladies who commented about this. If it’s a lunch, it certainly wouldn’t be very filling for most kids I know. Judy I think Barbara must not have been thinking straight. Of course this kind of thing would happen because we humans are curious creatures aren’t we. The old saying that bad press is still good press is a grey area for me these days. Im on the fence about that one. Too many wannabe’s behaving badly to get noticed. Yawn Yawn, seen it all before. Kath … There are times when celebrities have rightfully complained about paparazzi, for example, when they try to take photos of celebrities’ children. I’d have problems with that, too. In Barbra’s case, she might just have wanted to assure that she had some privacy at home. And as for your daughters experience of moving – ugh!!!! 😦 I’d very tempted to give a company like that a scathing review – an outrageous service! 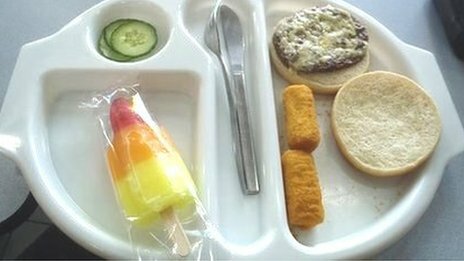 I remember the girl who posted her school meals, I don’t blame her – that’s not food on that plate. Eating like that everyday must be harmful. No excuse for meals being poor, they’re paid for by tax and parents contribute too. They weren’t good in my school either. They looked lovely, but were essentially junk food. I’d always been a skinny girl, but four months attending that new secondary school and I was looking extremely plump. When I no longer attended the school I lost the weight, but it took nearly a year to get rid of the unwanted fat. I’m in agreement with people posting a bad review of a service they’ve been unhappy with, but I do feel if they do that they should have some evidence of what they’ve suffered, otherwise not only could they be sued for inventing a story but it could get out of control and become easy to ruin companies with one bad review. Although having said that – I’m sure it already happens. Suzy … If you check out the link on the moving company story, and then go to the 1918.com link on that story, you will see there was an extensive exchange of information. The company certainly did pick the wrong person to go after. How rotten to give a false negative review of a book. I’m glad that woman was found out. Great examples Judy. I remember reading about how Martha’s post went viral. Despite all its flaws the media does help keep things in check, What a powerful tool free press is in the hands of the common man. Madhu … The better course of action would have been to address the problem rather than trying to shut down a 9-year-old. That was a public relations disaster. I’m glad Martha was able to continue. I understand she raises funds thru her blogs to help a charity. You really got a great conversation ball rolling with this post, Judy! Excellent amount of thought and I loved your examples of unintended consequences. Your choice of a comic also went well with this, leaning on the circle of dominos is also demonstrating the domino effect. I was glad to read about the Striesand effect, along with how Barb brought up Brian Williams. So sad he felt he must fib to get attention about a serious matter. Already taking his life into a place of danger, that was enough to say. Leave off guns going into helicopters where witnesses would not verify the outcome. I am trying while babbling here to think of unexpected consequences. I think there have been some cooking disasters where the idea of using a certain food in a dish turned out mushy, strange or yucky tasting. That is my best effort after working a long day at the warehouse on Open Stock, Judy! smiles! Robin … My thoughts usually go to nature when I think of the term ‘unintended consequences.’ There have been examples of plants – a beautiful lavender flowering plant – brought to New York State. It looks gorgeous along the side of the road or in the medians. Well, the weed just overran native plants. Crowded them out. The state tried to get rid of them. Not sure how successful the state was. I have heard about the nutria, which are a little bit of a rat but they have become too much of a pest, so sad. The swamplands have enough problems without inserting another one! Good intentions gone awry, Judy! I like that first drawing. The man looks happy with his dominoes going down as planned – except of course, when the last one falls on him. I used to work with a girl who was grumpy with everybody. One day she joked with me – the first time in the three years I had known her. I took it very badly and snapped at her as I thought she was just being sarcastic. She was shocked at my response (despite the fact that she snapped at everybody herself) and apologized profusely. She never joked with me again and I actually preferred it that way. Why would she suddenly be friendly after being aloof for years? I also did not want to let my guard down and have her hurt me when I had started to think that we were now friends. Your coworker’s behavior is perplexing. Why the change of heart? Maybe she decided to turn over a new leaf? But I don’t blame you for being wary.